Muvi allows you to add multiple languages to your store. By adding multiple languages, you can translate your website/app into different languages. When your users select their preferred language in your website/app, they will see the content in that language. The language is auto detected according to the Geo-location of the users. You can translate different sections of your store like player, subscription, general section etc. You can also enable/disable any language, set a primary language, import multiple language, change the language name to native etc. Click on “Add Language” button. Type the language name on the search bar that you want to add. Then click on “Save”. The particular language will be added to your list. You can add as many languages you want. You can enable "Auto Detect Language" feature, so that when users of a specific region access your website/app, the content of the website/app will be automatically changed to the language of that region. For example, you have added Japanese language and translated the content of your website/app to Japanese language but you have set your default language to English. When users in Japan access your website/app the content will be automatically changed from English to Japanese. No manual intervention is required. Under "Language Settings" select the check box "Auto Detect Language"
To disable this feature, simply uncheck the check box. You can change the English name of a language to its native name to make it easier for people to choose their native language from the drop down menu of your website. For example, the native language of Italy is “Italiano” while its English name is “Italian”. You can change Italian to Italiano. To change language name, go to “Settings” -->”Language”-->”Manage Language” in your CMS. In the “Add Language” section, type the English name of the language you want to add in the search bar. Then select the language and click on “Save”. The language will be added to your list. Now, click on the language to change its English name to native name. Change the name of the language and click on the tick mark to save. There are 2 methods available for translation. In the first method, you have to do the translation directly in your CMS. Here you have to translate each filed name manually to other language. 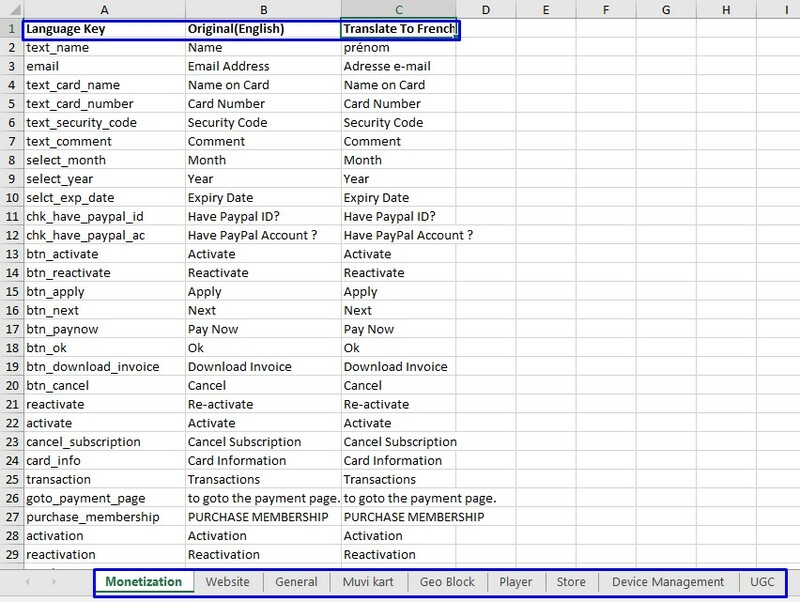 In the second method you have to export the field names in CSV format (MS Excel) to your computer. Then after translating the fields manually, you have to import the translated data in MS Excel file to your CMS. In this process you can translate multiple categories at a time. You will see different categories and sub-categories for translation. You can select any category for translation. Under each main category there are sub-categories. Under each sub-category there are different fields which you can translate to your preferred language. Under a main category, click on a sub-category. (For example, under "Monetization" click on "Subscription" to translate all the fields and labels related to subscription) You will see "Original Key" and "Original Text" for different fields. Select the "Language " from the drop down menu on the top right corner of your screen. Click on "Copy All" next to "Original Text. All the original text in English will be copied to the translation field. Manually change the original text in English to your preferred language. (For example, for “Name” you have to type “prénom” if you are translating to French). Click on “Save” on the top of the screen to save the translations. You can translate any group or all the groups by following the above mentioned procedure. We support any number of characters in a single translation key. That means you can translate a whole paragraph. To search a particular translation key in a specific category, first, you need to expand that category by clicking on it and then select CTRL + F key on your keyboard and type the key name in the search bar. In the Translation page of your CMS, first select the Language from the drop-down (For example, if you want to translate to French, then select French). Click on “Export”. The MS Excel file will be downloaded to your computer with all groups and fields that can be translated. After completing the translation, save the MS Excel file. Select the language to which you are translating from the drop-down. (If you are translating to French then select French). Import function may not work properly if you will select the wrong language. You can do translations for different categories (i.e. Monetization, Website, UGC etc.) in a single MS Excel file and import them at a time. You can easily translate the content metadata in content library by using the Language Translation feature. When your users select a language on your website, they can see the content title, description etc. in their chosen language. When your users select the language on your website’s drop-down menu the content metadata will change to their preferred language. Note: Remember that, first you need to add your content metadata in English and then you can translate it to any language. You can translate the values of any Custom Metadata field . For example, in Genre list you can translate all the values (i.e. Action, Horror, Comedy) to your preferred language. Note: First, you need to add the values in English while creating the list. Now the values of the Metadata Fields are translated into your desired language. To add these translated values to new content form, go to "Content Library"-->"Add Content"
Add all the Metadata in English and click on "Save & Continue"
Finally, click on "Update Content"
When your users visit your website and select their preferred language from the drop-down, they can view the metadata of the content in their preferred language. You can translate the Cookie Message for your website. When users will visit your website, they will see the cookie message in their preferred language. First, type the cookie message in English and click on "Save"
Change the cookie message to the selected language and click on "Save"
When your users open your website, they will see the cookie message in their preferred language. You can translate the PPV category name and description. When your users click on a content for which PPV value is already set, they will see the category name and description in their preferred language. When users click on a PPV content, they will see the Title and Description of the PPV category in their selected language. On your homepage featured section, you can translate the name of the featured section. When your users will select their preferred language on your website, they can see the featured section name in that language. You can translate the name of the subtitle languages you support for your store. For example, if you support Spanish subtitle and you want to show your users in Spain that you support this, then you can translate it into Spanish. (i.e. Español) When users in Spain try to select the subtitle while watching video in your store, they will see the subtitle name as "Español" instead of "Spanish". Select the language from the drop-down and translate the subtitle name to the selected language name. You can translate any static page to your preferred language by using our Language Translation feature. However, remember that, first you need to create a static page in English, then you can translate it to any language. To translate a static page, go to "Website" --> "Static Pages" in your CMS. On the left-hand side of any static page (That you want to translate), click on "Edit" under "Action"
Edit the page and click on "Save Page". The page will be saved in your preferred language. When a user visits the static page and select Hindi on your website, he/she will be able to see the page in Hindi. You can translate Email Triggers in your CMS, so that your users can receive email notifications in their preferred language based on their action. For example, if a user selects his/her preferred language Hindi, then he/she will receive a “Welcome on Registration” email notification in Hindi when he/she registers on your website. Likewise, all the email notifications based on the user’s action will be sent to the user in Hindi. All the email triggers in the CMS are in English by default. So, you need to select each user action from the drop-down list and translate it to any other language. To translate “Email Triggers”, go to “Marketing” -->“Email Triggers” in your CMS. Change the language of Email Subject and Email Content from English to the language which you have selected from the drop-down list. Finally, click on “Save” to save the translation. Note: English is the default language. Please do not change the content from English to other language when English is selected. Always do the translation by selecting the preferred language from the top right corner of your CMS. This is a sample email (See Below Screenshot) how your subscribers will receive the "Welcome on Registration" email when they register to your website by selecting the Hindi language option from the drop-down menu on your homepage. If you want to translate a term that is not listed under the Language Key then you can add a new "Language Key" for that term. For example, if you want to translate the word "Produced By" and that is not listed under the language key, then you can add it. In the Translation page of the CMS, click on “Add Keyword” (See Below Screenshot). Finally, click on “Save”. The new Language Key will be added to the Translation page. By using our Language Translation feature, you can translate your entire website and apps. You can translate the following sections by using this feature. 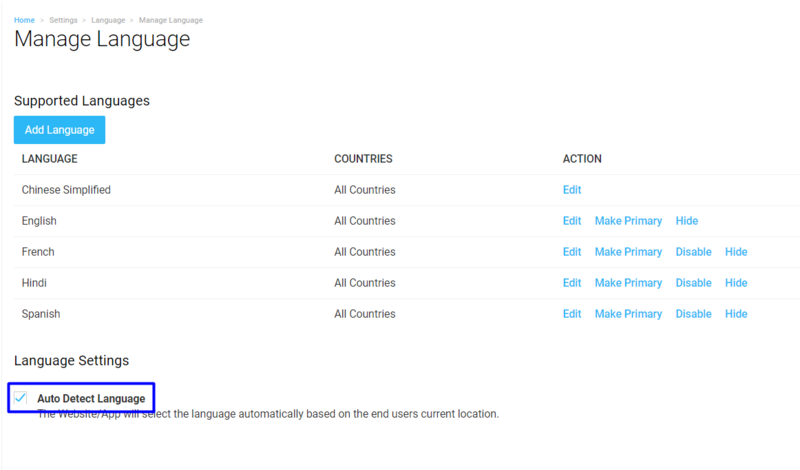 You can select the language from the language drop down menu from the top header to translate each functionality/page. Note: This process is consistent across all pages and functionalities that support multiple languages. If you wish to show/hide any language in the language drop-down list of your website, you can do it so in the CMS. To hide any language in the drop-down list, go to "Settings"-->"Language" --> "Manage Language"
Click on "Hide" on the right-hand side of the language, next to 'Disable"
When asked for confirmation, click on "Yes"
The specific language will not be displayed in the language drop-down list of your website. Go to "Settings"-->"Language" --> "Manage Language"
Click on "Show" on the right-hand side of the language, next to 'Disable"
Note: You cannot Show/Hide default language.